Evolving the Ecosystem: Making every day International Women’s Day | The Forum Network, hosted by the OECD: Shape ideas. Shape policy. Shape the Future. Although broad progress towards gender equality has been made, women at every level across the world are still at a social and economic disadvantage. 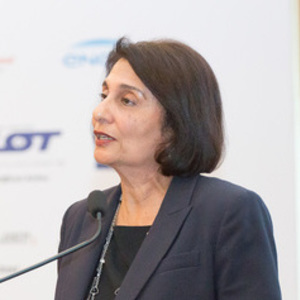 Rohini Anand, Senior Vice President for Corporate Responsibility and Global Chief Diversity Officer, Sodexo, shares a four-step plan to encourage gender parity at the workplace. The OECD’s recent report, The Pursuit of Gender Equality: An Uphill Battle, highlights how far we have to go before the mission for gender equality worldwide is fully accomplished. Despite progress in many countries, social and economic inequities persist across all levels of society, with women still facing stark gaps in salary, leadership representation, unpaid work and more. Further, the report concluded that progress remains far too slow. Although we agree with the OECD’s conclusion that gender equality must become a top priority for governments worldwide, we believe that the private sector also has a crucial role to play in addressing the issue of gender inequality. A recent report from the World Economic Forum estimated that, at the current rate, it will take 217 years to fully eliminate gender disparities in employment and pay. For us at Sodexo, this is simply unacceptable. We are committed to accomplishing gender parity in our company far sooner, and have implemented numerous initiatives and strategies to help us achieve this goal in the near future. One such example is our ambitious target to have women represent 40% of our senior leadership positions by 2025. However, no target can be achieved or sustained in isolation. We firmly believe that the entire ecosystem must be engaged for sustainable cultural transformation: this means placing a specific emphasis on engaging the hearts and minds of the workforce. We have, therefore, adapted a four-pronged approach to help us achieve and maintain gender parity across all levels of our organisation. The first element of our approach is the most critical: the commitment of senior leadership. Sodexo’s executives are firmly committed to gender equality, and continue to position this goal as a highly visible and essential element of both our company’s Quality of Life mission and business strategy. In addition, they collaborate with one another and engage with all levels of the organisation to that end. The SWIFT program, for instance, consists of senior-level women and men from around the world who work together to develop and implement strategies that champion gender parity across all business lines and regions. The second part of our approach involves metrics and accountability. Specific targets are vital for monitoring our overall progress, as well as the effectiveness of the various programmes and initiatives we have undertaken. Importantly, these targets apply beyond senior leadership to all levels of the company. Our 2025 target is to achieve 40-60% female representation not only in senior leadership, but also in all management teams and business units. Further, we have linked 10% of annual incentives for executive-level staff to help achieve the 2025 benchmark. Third, we have implemented company-wide initiatives aimed at creating an inclusive culture and leveling the playing field. For example, we offer a number of mentoring programmes designed to help promote career development and growth among female leaders. Our IMPACT programme pairs mid-level managers with executive-level managers in a year-long, structured mentoring program. Another example is our FLOW (Flexibility Optimises Work) initiative, which promotes employee access to flexible work locations and schedules. These flexible arrangements create a culture where men and women can more effectively integrate their home and work life. The fourth and final aspect of our approach is to build a strong business case for gender parity. Our effort in this area is demonstrated by our Gender Balance Study, a multi-year, longitudinal analysis of gender-balanced teams or entities with 40-60% women. This study confirmed that these groups outperformed those that were not gender-balanced on key financial and nonfinancial performance indicators, including employee engagement, employee retention, safety, operating margin and client retention. This study has been very effective, informing our managers of the importance of gender-balanced teams for enhanced business outcomes. So far, the results have proved very promising: 50% of our board is now made up of women; in 2009, only 17% of women were in senior leadership positions while today that number is 32%. 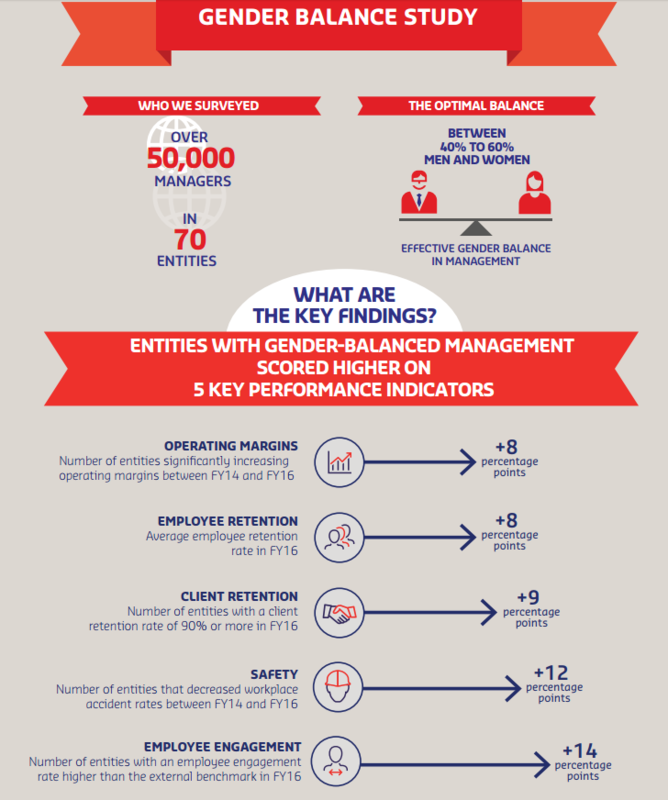 In 2017, 59% of our employees worked within entities with gender-balanced management – a 2% increase from 2014. Additionally, diversity and inclusion has been one of the top two drivers of engagement. Although we are proud of our progress, we realise that we still have much more work to do. Our goal will require continued effort and co-operation, and we are committed to staying the course. Until gender parity is fully achieved, every day will continue to be International Women’s Day at Sodexo.